The 10 fields on this tab represent ten of the labels that will appear on the Fitting Notes form you will see later. Use these labels to customize the program and store additional information about individual fitting sessions. Some of the things that you may want to track are the initial setup information such as bar, stem and saddle position. 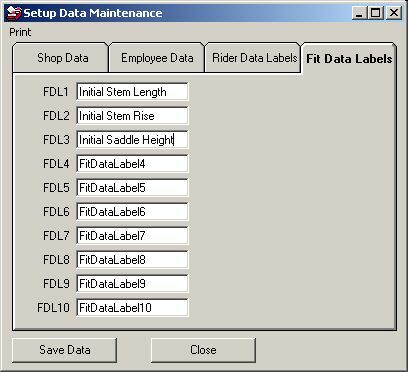 There is no need to use these fields for storing frame dimensions, as they are stored at bike setup in existing fields.